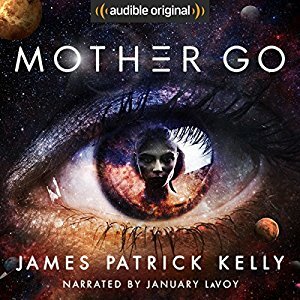 Mother Go, James Patrick Kelly; January LaVoy, narrator (Audible, $29.95, 10 hrs., un­abridged, digital download) July 2017. We first meet Mariska in 2159, (essentially the story of “Going Deep”) as she’s awakened in her moon-habitat room by an annoyingly chipper AI, which effectively serves as a parent, along with her adoptive father, Salvatore de la Rosa – who we soon learn has been contracted by Mariska’s mother Natalya to help raise Mariska while she is off being a spacer. Mariska has a reasonable social life and a boyfriend named Jak, whom she fully expects to marry someday, but is haunted by questions of what will happen to her when Sal’s contract runs out, and more importantly why she was born (through an artificial womb) in the first place. It soon becomes apparent that she’s expected to join her mother on the crew of a star­ship – informally called Mother – taking colonists on a one-way expedition to a newly discovered Earthlike planet in the Builders galaxy, 54 mil­lion lightyears distant (“Best ever. Not like Earth, crispy and crowded. Or Mars, cold and dusty”). But Mariska wants nothing to do with her long-absent mom or her projects, though she shares with her the rare ability to enter a state of hibernation without the support of the special nanotech equip­ment that makes it possible for others to travel for years in space. Almost inadvertently, and more or less in a fit of pique, she enters this deep sleep and wakes up three years later – only to meet her mother, discover that Sal and Jak have moved on with their lives, and learn that the colonization project has become a fiercely debated political and economic issue. Feeling more rootless and alienated than ever, Mariska joins the crew of an asteroid mining ship, and after surviving a tragic accident (basically “Plus or Minus”, by itself another neat critique of Cold Equations-ism) finds herself regarded as a kind of interplanetary hero. On Mars, she meets and eventually falls in love with a genetically altered Martian named Elan, which causes her to rethink her feelings about joining the colony ship, which he plans to join as well. 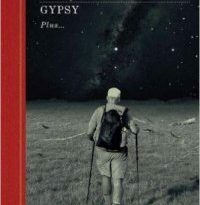 Much of the rest of the novel involves the political manipula­tions and conspiracies that surround the project, and Mariska’s gradually thawing relationship with her “mother” Natalya, as well as with the starship also called Mother (which presumably is the source of the rather odd title). It’s something of a risk for any writer to attempt the point of view of a teenage girl as she grows to adulthood (she’s 26 at the end of the novel, though looks younger because of her years in hibernation), a risk complicated by her being a clone, and complicated further by a series of exotic settings ranging from the moon, to Mars, to a rustbucket asteroid mining ship – none of which are particularly original in conception, but all of which are realized with such offhand narrative confidence that we feel as at home in them as the natives. That’s what classic SF does best, of course, but what sets Mother Go apart is Mariska herself, not always sympathetic but continually compelling, as she tries to find a way to inhabit the worlds she inherits. This review and more like it in the August 2017 issue of Locus.